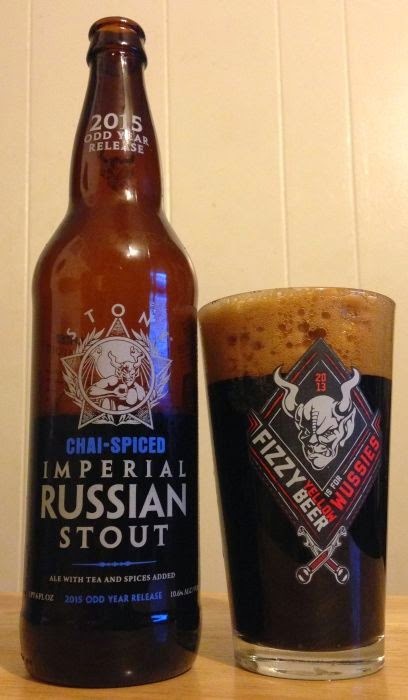 I'm a Stone Brewing fanboy, but this chai-spiced version of their Russian Imperial Stout is an overwrought mess. It just doesn't work for me. It pours dark, chocolate brown with a huge, foamy, tan head that leaves a lot of lace. The aroma is just overwhelming. Lots and lots of spice. Too much spice. It smells like someone busted every jar in the spice-rack. A particularly strong black pepper and cloves thing is going on, here. The flavor is more of that spice overload. The rich, roasted malt is there in the exhale, but it remains subtle in the background. I struggled to finish this 22 oz bottle, and I won't buy another.